Want to ride with us but haven’t been on your bike in a while? Want to try riding again with knowledgeable cyclists and support? 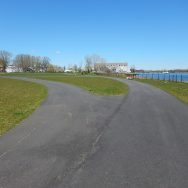 Meet us at Pope John Paul II Park and ride with us to Joseph Finnegan Park at Port Norfolk. There you can get used to riding again in a very safe, contained park. For those who would like, riding the Neponset River Trail is also an option. Map of Ride location.